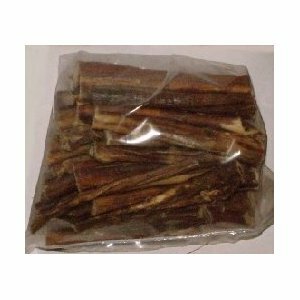 A natural air dried treat from Beef Cattle Long lasting and very popular Good for Teeth & Gums Very Thick Pizzles For Medium & Large Dogs 5-6 Inches Long 0.5-0.75 Inch Wide Bully Sticks can aid in keeping gums healthy, removing tartar and can help clean teeth if used regularly. As always though we do like to remind dog owners that nothing beats teeth brushing. We recommend that if you want to make the Stick even harder that putting it in the freezer overnight is a good option. Not only does it make it a little tougher but it is also good for teething gums if being given to a teething pup. We grade Bully Sticks as 3 on our Chewtastic Scale "These chews are tough & longer lasting. If your dog is a power chewer they could be gone in a day, or even an hour if they are determined. Fussy dogs may not always like these harder chews & you shouldn't leave your dog unsupervised with them." As with all our tougher chews, we would recommend that you supervise your dog whilst they are eating. Although it is fully digestible and carries less of a risk than products such as rawhide, if a large chunk is swallowed this could cause a choking hazard. As with all treats you should feed Bully Sticks in moderation. The amount will depend on the size of your dog but we don't recommend feeding more than one a day and we always suggest people remember than as a general guide treats should not make up more than 15% of your dogs daily diet. Please note: Don't get us mixed up with any other websites or re-sellers, our pizzle sticks are top quality and very thick, if you think our prices may be a little more than others, just remember ours are very high quality and nice and thick.